Amy is a stickler for good form. She will ensure that you understand the moves you are performing and make sure that perfect form is consistently followed. 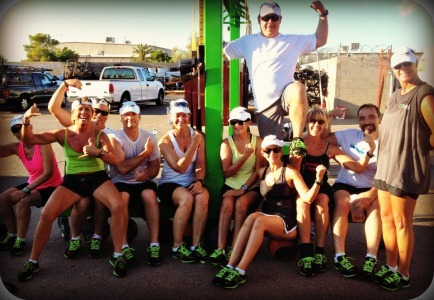 The small group classes promote accountability and camaraderie. The workout programs are very challenging. You will welcome the end of the class. The warm-ups are as difficult as the workout programs. She implements Tabata moves (advanced form of cardiovascular exercise) for the warm-up which are designed to dove-tail with the workout program. Amy invests in the most up-to-date equipment utilizing TRX bands, gymnastic rings, kettlebells, dumbbells, Dyna-Max balls, Perfect Push up equip, etc. to work every muscle in your body. Amy is concerned about each individual trainee and is keenly aware of their health issues to ensure that the trainee won’t be injured. Heart rate training, nutrition and hydration are all emphasized to give the trainee the most benefits possible from a workout session. She is constantly looking to bring on new programs to supplement the workout with more fun, like trekking, running, Tough Mudder training, etc. Most of all, the work-outs are fun and each one is different from the next. An hour and a half passes by so quickly and before you know it, you are exercised and happy. Check out upcoming AVC Elite Training Sessions and contact Amy today to reserve your spot in these challenging workout programs right here in Mesa, Arizona. This entry was posted in AVC Elite Training and tagged Form, Heart Rate Training, Running, Testimonials by avcelite. Bookmark the permalink.